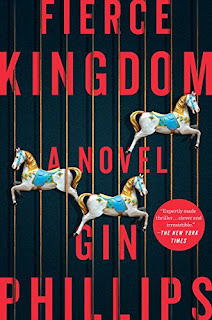 Well, if how quickly you finish a book is any indication of how much you like a book, then I think it is safe to say I “liked” Fierce Kingdom by Gin Phillips. However, it is certainly not a “fun” read as its topic is horrifying and little too close to home. This is another Book of the Month pick that I would have never chosen on my own, so I am once again, thankful for them presenting me with new options. I don’t know why I decided to bravely choose this one as it was sure to make be uncomfortable, but I did. Why? Well, the basic premise is a mom is with her four-year-old son at a local zoo around closing time when it is taken over by shooters. As the mom and son head to the gates, they hear the shots and she sees the bodies. And, so she runs with her child and hides. It is basically every mother’s worst nightmare scenario come to life. True confession – this is the type of thing that keeps me up at night. Unfortunately, we live in a world where this kind of violence is happening more and more. And, I will not deny that I have tried to exert some control over possible scenarios by imagining what I would do in these situations. Which is why I decided to read this one. I did put it off until my kids had been safely in school a few weeks, because, well, I just couldn’t bring myself to go there. But, after a week of slogging through a boring book, I knew I needed to jumpstart my reading, so I picked this book up yesterday at nap time and proceeding to devour it in one 3-hour sitting. It is extremely fast-paced. You want to know what is going to happen, why it is happening, and who all it is happening to. While it is certainly horrifying to imagine, I did take heart in reading about the efforts this mother goes through to hide and protect her child in this nightmare scenario. And, it possibly gave me some things to think about should I ever be in a similar situation, God forbid. I will say that while I read it in one big gulp, I was left with many questions. And, they are the types of questions I think are left to be unanswered, such as in any tragedy. LIGHT SPOILER - One particular one is haunting me – what about the baby in the trash can?? Ultimately, if a mom who has family safe words and has discussed similar family safety routines in various scenarios can read this without needing to breathe into a paper bag, I think you can too. * If you want to give Book of the Month a try, check it out here!